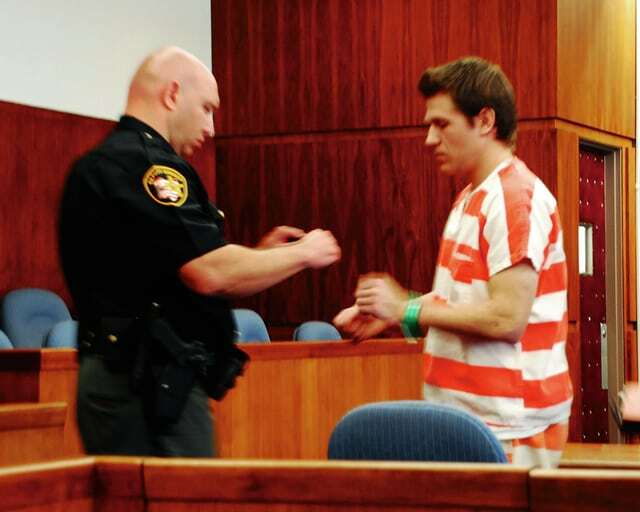 David M. Armstrong is taken into custody Monday following a sentencing hearing in the Champaign County Common Pleas Court. Armstrong was sentenced to six years in prison stemming from a May 15 incident in which he shot at two passing vehicles from his residence. A man who pleaded guilty to shooting at passing vehicles from his residence was ordered to serve multiple years in prison Monday. David M. Armstrong was sentenced to six years in prison during a sentencing hearing in the Champaign County Common Pleas Court. Armstrong, 29, of 11253 W. state Route 29, Conover, pleaded guilty in June to one count each of attempted felonious assault with a one-year firearm specification, attempted felonious assault and aggravated possession of drugs, stemming from a May 15 incident. Champaign County sheriff deputies arrested Armstrong on that date after responding to his residence on a report of shots fired at a vehicle. Law enforcement found Armstrong fired a .223 caliber rifle from his property, striking two vehicles including one that was occupied by a female driver and a 2-year-old child. No injuries were reported as a result of the incident. The sheriff’s office shut down state Route 29 at the railroad tracks in Rosewood and state Route 29 at state Route 235 to prevent any vehicles from traveling in front of Armstrong’s residence. During Monday’s sentencing, Champaign County Prosecutor Kevin Talebi said Armstrong’s conduct created danger for local residents and law enforcement while causing the roads around his residence to be shut down. Talebi later stated a propane leak caused by Armstrong firing at a propane tank put firefighters and law enforcement who responded in danger. Armstrong apologized for his conduct saying he regrets his actions from that day. A former military member who was discharged in 2007, Armstrong was asked during the hearing about his mental health since then. In handing down the sentence, Champaign County Common Pleas Judge Nick Selvaggio noted the sentence was less than the maximum sentence. Armstrong only received the maximum one-year sentence for the aggravated possession of drugs charge while the other charges are consecutive with this charge. In addition to the prison sentence, Armstrong was ordered to pay restitution in the total amount of $2,490.43. Upon his release, Armstrong is subject to post release control for a period of three years.